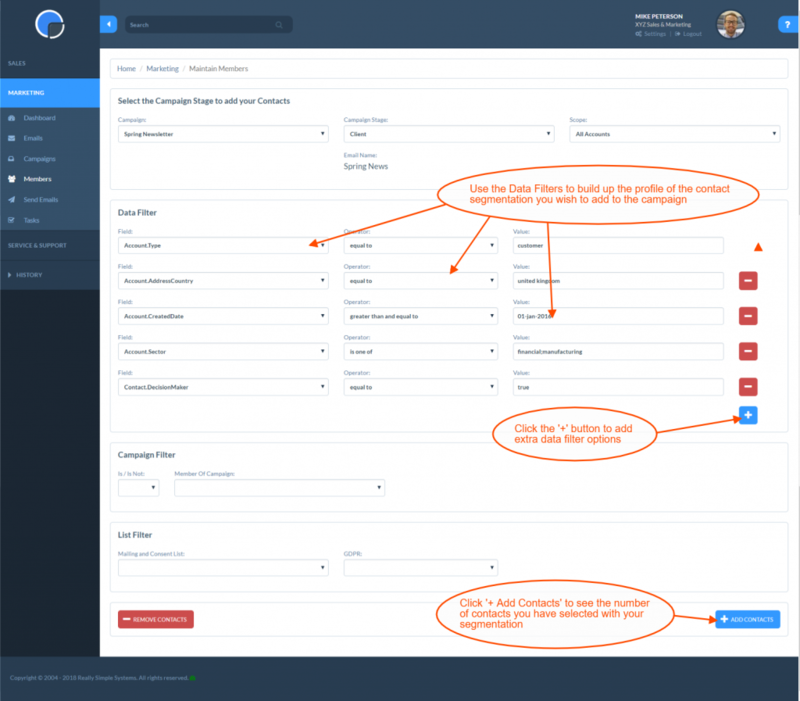 With the Really Simple Systems Marketing module you can create sophisticated segmentations of your CRM contacts for your marketing campaigns, and cross-refer them against your Mailing & Consent Lists. When Contacts are added to a Campaign Stage we refer to them as Members. The Contact becomes a member of that Campaign but they can also be members of multiple Campaigns. 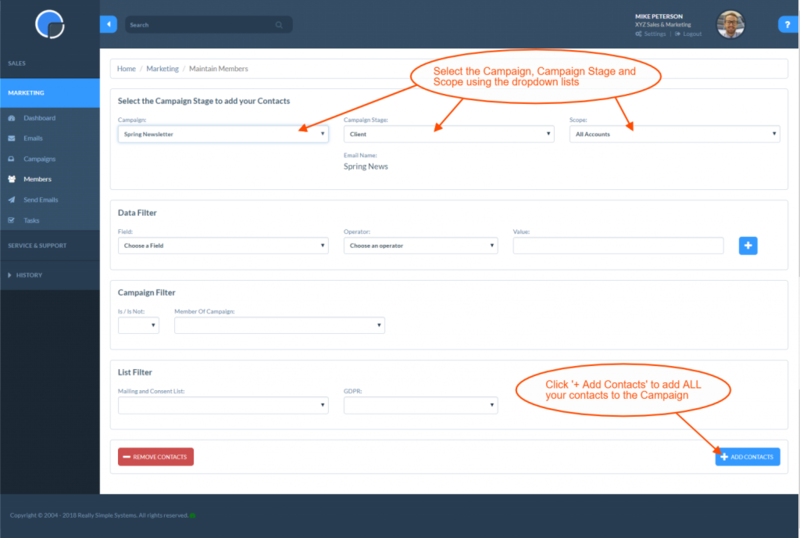 You can add and delete Members in bulk using the Members tab on the Marketing menu, or directly to a Campaign Stage by clicking the ‘+ Add‘ button on the Campaign Details grid in a Campaign Stage’s page. 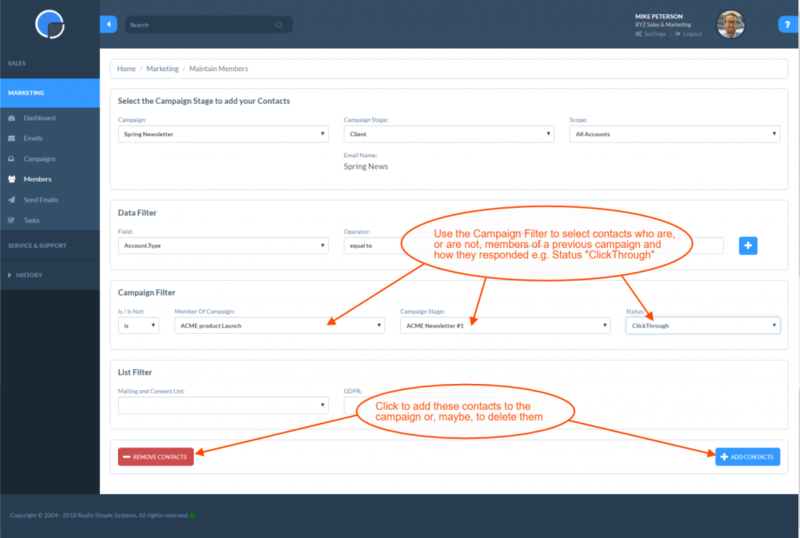 To add ALL your Contacts to a Campaign, select the Campaign and Campaign Stage you wish to add the Contacts to, then click the ‘+ Add Contacts’ button. Should you wish to remove the Contacts you can reverse the action by clicking the ‘- Remove Contacts’ button. With the Data Filter option you can select multiple criteria to segment your data using the field name, operator and value boxes. For example, to select only existing customers you might set the field name box to “Account.Type”, the operator box to “=” and the value to “Customers”. You can add more Data Filter rows to further segment your selection using the ‘+’ button. See Data Filters for more details. Clicking the ‘+ Add Contacts’ button will display the result of your selection. It will show how many Members you already have in the Campaign (if any) and how many more Contacts you will be adding. Click ‘Add Contacts’ to confirm the action. You can build up complex profiles by adding and deleting Members using consecutive additions and deletions. You can also add Members after a Campaign Stage has started running. 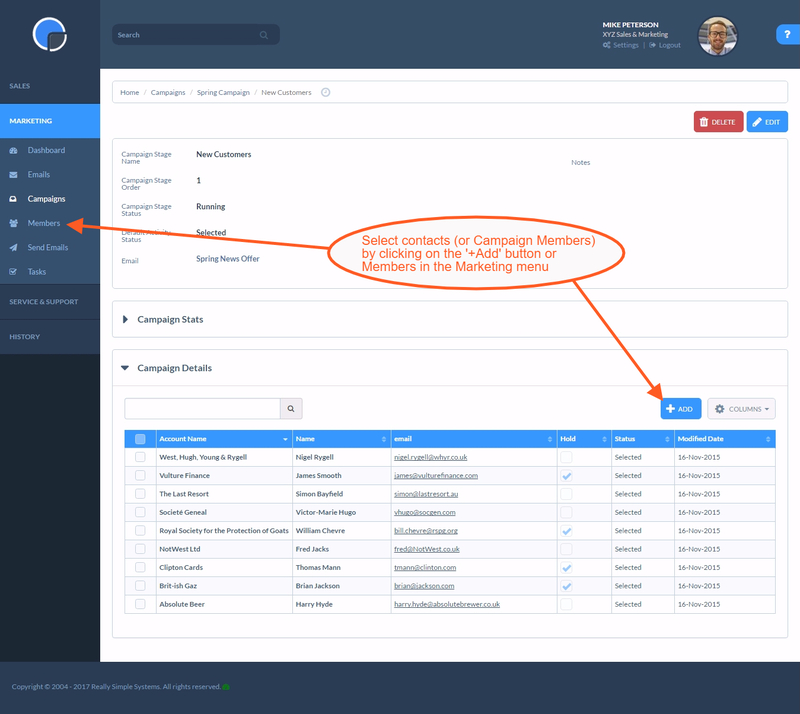 If a Contact has previously been mailed in another Campaign or Campaign Stage you can select or deselect according to their behaviour. For example, if they clicked through on a previous campaign or did not open the mailing. The List Filter option lets you select or deselect Contacts in your Mailing & Consent Lists, i.e. contacts who have given permission to receive your marketing messages, to comply with GDPR. 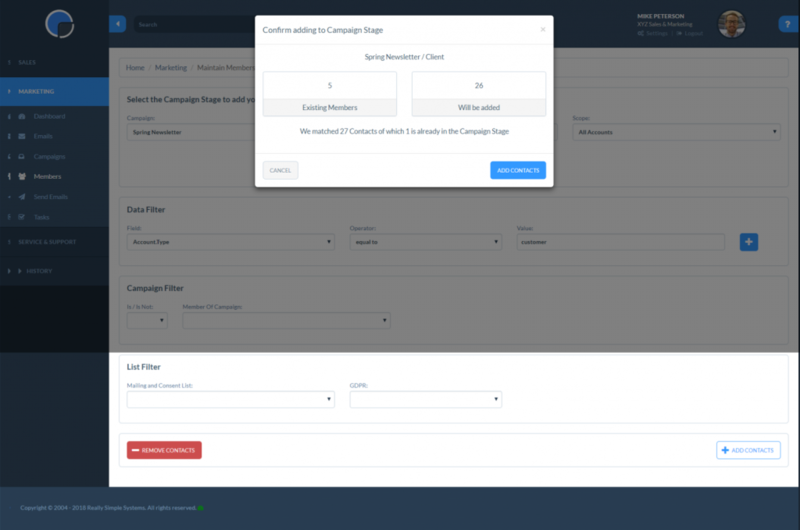 Leaving the List Filter boxes blank will override any consent data and all contacts will be added to the Campaign Stage e.g. for mailings where consent is not applicable. Selecting a Mailing & Consent List from the dropdown list will select just your contacts on that list. If you are also using Data Filters and/or Campaign Filters the selection will be cross-referred against your Mailing & Consent List to only select those contacts who meet all the criteria. 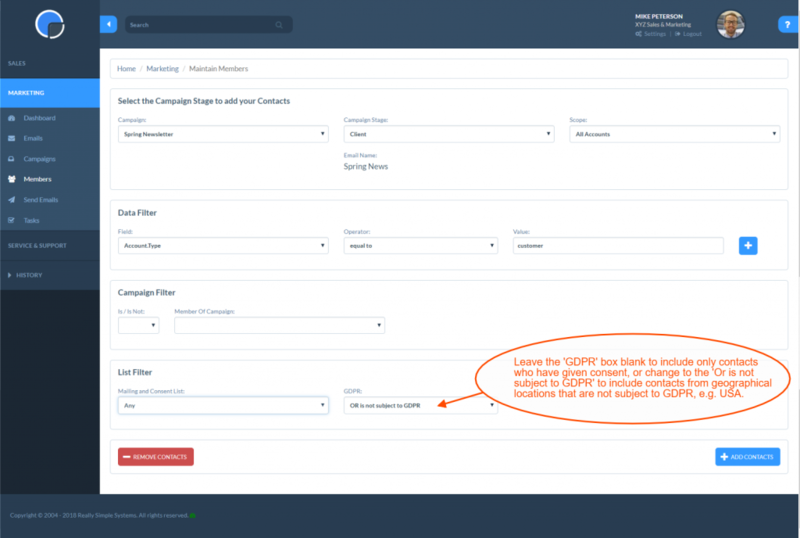 If your selection includes contacts from geographic regions located in both GDPR compliant countries and those that are not, you can use the ‘GDPR’ box to select “Or is not subject to GDPR” to override the Mailing & Consent List filter for those contacts. For example, if you want to mail only consenting contacts in countries where GDPR is applicable but also mail all contacts in other countries. Once you have added (or removed) your contacts, you can return to the Campaign or Campaign Stage by clicking the links in the pop-up box. You can manually change an individual Member’s Activity Status by viewing Members from the Campaign Stage page, from an Account page, and from a Contact page. If the Campaign Stage is an email, then the Member’s Status will be updated to reflect Opens, Bounces, Unsubscribes and Click throughs.